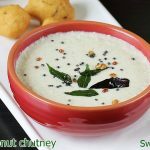 Coconut chutney recipe – I make coconut chutney almost 3 to 4 times a week, not only to accompany our typical South Indian breakfast foods but also for evening snacks like pakora, vada, sandwiches and even for plain rice. Yes we Telugu speaking people make a special kind of kobbari pachadi to serve with plain rice and ghee. I am yet to share that recipe on the blog. Coconut chutney is a basic condiment made by blending fresh coconut, chilies, cumin, ginger & salt. It is then tempered with little oil, mustard seeds, red chili, hing & curry leaves. The other varieties of coconut chutney are made with the addition of fried gram, chana dal, red chilies, shallots, garlic, coriander leaves, mint leaves etc. 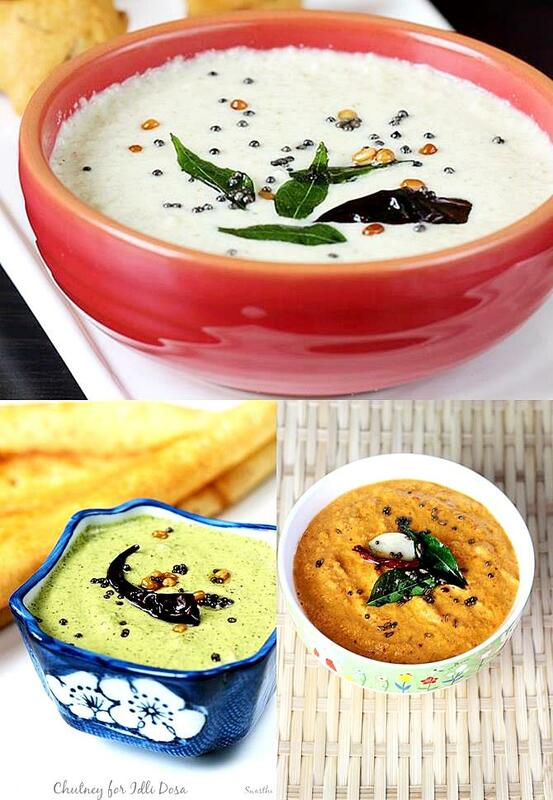 Each of these give a different taste to the coconut chutney. I keep experimenting a lot with various ingredients & found some of these add a really good taste & aroma. 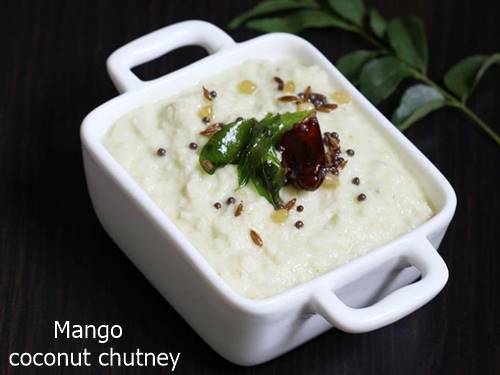 1.Coconut is the star of this chutney. So always use fresh coconut or frozen one. Though desiccated coconut can be used, it does not yield a really good chutney. If using frozen coconut, thaw it in the refrigerator and not in the microwave. We make coconut chutney even with copra or dried coconut (not desiccated coconut) following the same recipe mentioned in the recipe card. This chutney will be naturally sweet and very aromatic. 2.Fried gram or bhuna chana is one of the ingredient that is used in the chutney. It adds a thick texture & a nutty aroma to the coconut chutney. If you are not accessible to it, just replace it with chana dal or bengal gram. It has to be roasted until deep golden & used. 3. 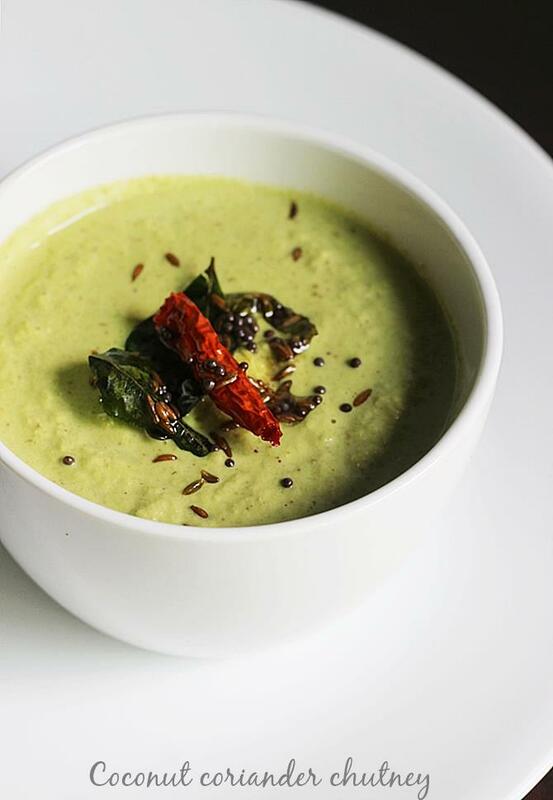 Chilies are used to add heat & spice to the coconut chutney. Green chilies are the best choice but red chilies can also be used. Just fry the red chilies in hot oil until crisp and then blend them with other ingredients. 4. Tamarind or lemon juice : I do not add tamarind or lemon when it is made to serve with idli dosa as the batter already has a faint hint of sourness. It is best to consume coconut chutney with in few hours of preparing. However it keeps good for two days if stored in a air tight steel or glass container. A fresh hot seasoning to the refrigerated chutney brings back all the freshness. If you plan to refrigerate the it then just blend coconut, salt, cumin, green chilies & ginger with some water. You can also use mint & coriander leaves. But avoid using ingredients like onion, roasted gram, peanuts & tamarind. These ingredients will alter the taste of the coconut chutney. 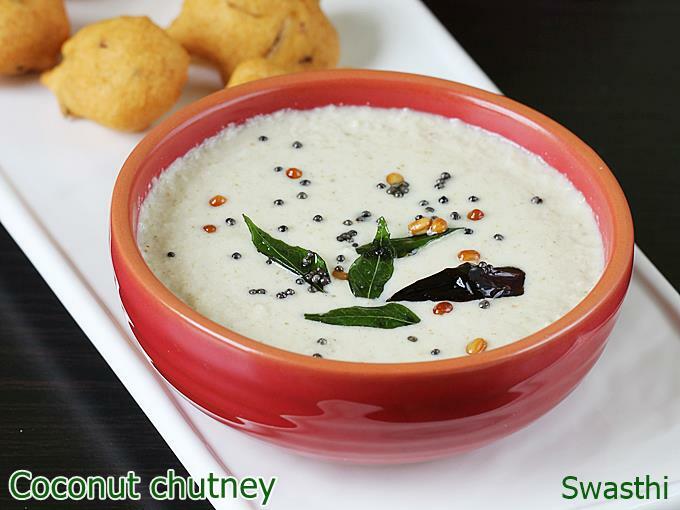 Coconut chutney made with lemon juice goes good with snacks like vada, masala vada, sandwiches etc. To use tamarind, soak very little tamarind in little hot water. Squeeze up the pulp and filter this. Use this along with plain water as needed to grind. If using lemon juice, add it towards the end. 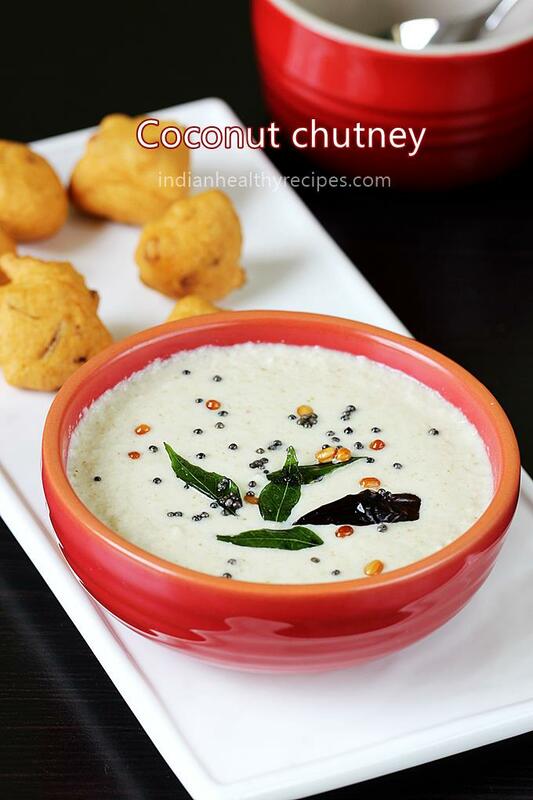 How to make white coconut chutney? Use only white coconut gratings, avoid brown parts. Next use only small hot green chilies, avoid long and thick green chilies. There must be more coconut and less fried gram in the coconut chutney. For half cup grated coconut, 1 tsp of fried gram would be sufficient. You can make so many variations to this basic coconut chutney like adding some mint, coriander leaves, garlic, lemon juice, tamarind etc. You can also make getti chatni / thick chatni that is served in banana leaf in Tiffin Hotels. 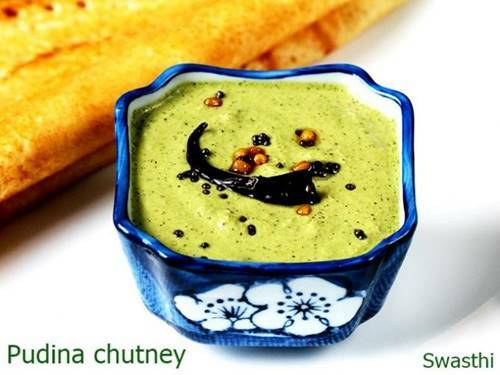 Recipe is the same as below, but grind with less water to make a thick chutney. 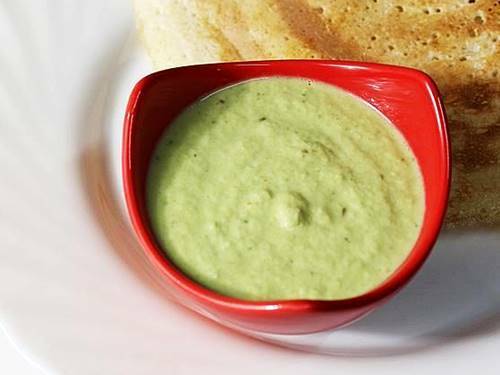 Easy coconut chutney to accompany most south Indian breakfasts like idli, dosa, vada & pongal. 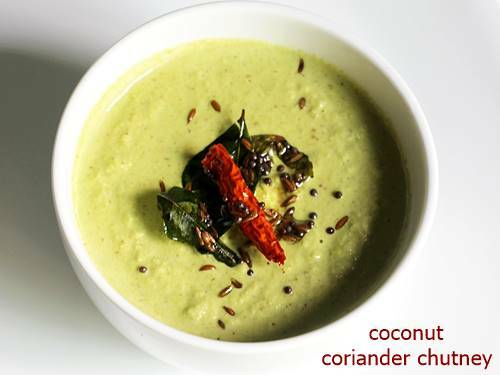 Add coconut, ginger or garlic, cumin, green chilies,salt & fried gram to a blender or chutney jar. If you do not have fried gram dry roast peanuts or chana dal until golden and aromatic. Cool and add them to the jar. If desired you can add little lemon juice or add tamarind. Blend all the ingredients well without adding water. This helps to get smooth chutney. Scrape the sides. Blend until smooth. Pour water as needed and blend to get a smooth coconut chutney. Taste it and add more salt and chilies if needed. Transfer the chutney to a serving bowl. Heat a pan with 1 tsp oil. Add mustard when they crackle add red chili, 1 pinch urad dal (optional) and curry leaves. When the curry leaves turn crisp, add hing and pour this over the coconut chutney. This is a simple one which I at times make when I do not have green chilies. It is different from the kerala style red coconut chutney. It is very aromatic and tastes nutty. Method: Heat a tsp oil and roast red chilies, chana dal until golden. Add shallots and saute for a minute. Cool and then blend with other ingredients. If using fried gram just blend all the ingredients without onion. Later add water as needed. Temper as mentioned above in the recipe card. Tip to make the chutney smooth you need a heavy duty blender otherwise soak the roasted red chilies for some time in water before blending. One of the best chutney to start your day as it ignites the digestive fire and keeps the digestion good for the whole day. This chutney is great not only for breakfasts but tastes wonderful when accompanied with fried snacks like bonda, vada, kathi rolls, wraps and even sandwiches. You can find a detailed step by step guide here on this post of coconut pudina chutney. Brief recipe here. Method: If using bhuna chana or fried gram, just add all the ingredients and blend first. Then add water little by little and blend. If using chana and urad dal roast them until golden. Cool and use them to blend along with other ingredients. Temper as mentioned in the first method. For south Indian breakfasts and sandwiches. It can also be used to spread while making kati rolls and chatni sandwiches. Blend all the ingredients in a blender with water as needed. 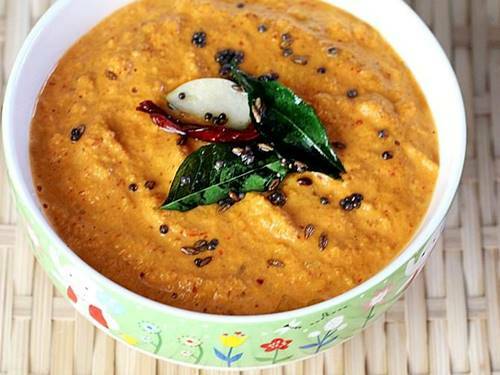 To make this mango coconut chutney, Fry 1 tbsp of urad dal & green chilies in 1 tsp oil until golden. Cool & blend them together with half inch ginger, salt, half tsp cumin, half cup grated coconut, 3 tbsp water & half cup cubed raw mango. Then temper the chutney as mentioned in the recipe card above. I prefer to use raw carrot for this chutney. Tender & young carrots taste very good. 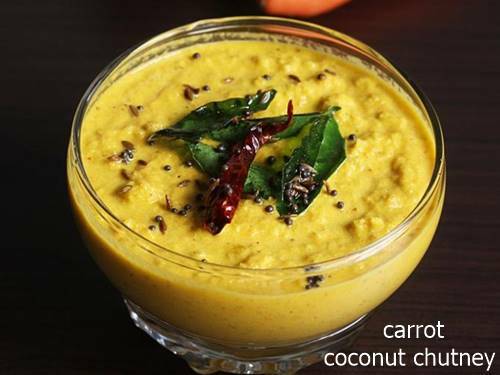 Fry 1 tbsp chana dal & green chilies in 1 tsp oil until golden and aromatic.Cool and blend with half cup coconut, half cup chopped carrots, 1 garlic clove or a small piece of ginger, 2 to 3 tbsps water, salt & half tsp cumin. You can temper the chutney with mustard, curry leaves & red chili following the recipe card. You can find the recipe of coconut capsicum chutney here. Coconut meeru ela grate chestharu. Please reply Cheyandi. 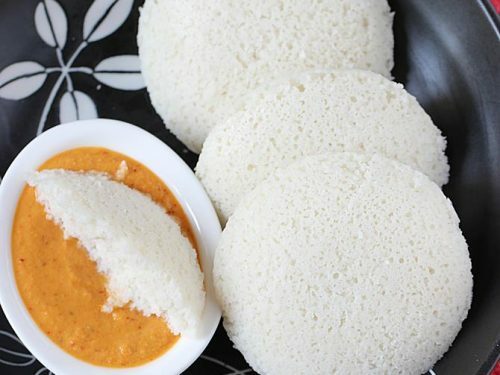 Naaku coconut chutney Chala ishtamu kani kobbari grate cheyatamu kashtanga undhi. Mee recipes chala baguntaee. Thank you very much. I use fresh coconut most times. 1 coconut lasts for 3 days. I remove the coconut from the shell using a large knife. I begin with the sides and just make long & deep incisions into the coconut. Then poke the knife & remove it. Then chop to pieces and store it fridge. I use up this to make coconut chutney in the next 3 days. Sometimes we also grate it using a hand grater. The one we get in India but it is the harder way. If you try the knife method, do wear a glove to protect your palm. Hope this helps. I am planning to buy a wet grinder with a coconut grating attachment. I am looking out for info on how good is the grating attachment as I want to buy it exclusively for grating coconut. We use a lot of coconut in our foods for coconut chutney and even for curries. one more question is can i make coconut chutney directly in the wet grinder after grating it. will the chutney remain good for a week at least. Please share your thought. Thank you. You are welcome. I think I am not good at reviewing a wet grinder any time. Practically a wet grinder hasn’t been of any help for me as I find my heavy duty mixer grinder very useful. It works so well to make batters, coconut chutney & everything else. I usually remove the coconut following the above method and when ever I need to make coconut chutney, I just add a handful of pieces from the fridge. I always feel cleaning a wet grinder is a lot of work. Even my helper refuses to do that. We are a small family so i am not using the one I have. 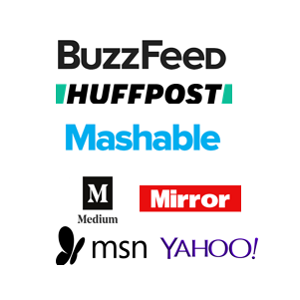 But yes the method you mentioned is followed by hotel people. But regarding the coconut chutney I can tell you it will very keep good in freezer & fridge if you make it without dal. I tried idli,it became so soft,I never made this much soft idli before.The way u explain each step and tips is excellent. Thanks for trying. So glad to know the idlis came out good. I’m very glad that I found this blog on Internet. It is difficult for me to buy fresh curry leaves. You are welcome. Thank you very much. You can just skip the curry leaves or use a bay leaf for curry recipes. I am a PU student and I tried Punjabi egg curry and it came so well. It was beyond my expectations. You are welcome. Thank you so much for the comment. So glad to know the curry turned out good. Wishing you the best! 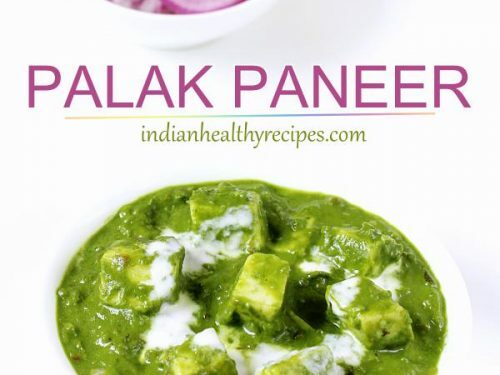 Today I tried palak paneer.. It came so well and yummy.. Whenever I need a variety item other than usual dishes, here is where I come.. so inspiring and easy to follow steps.. Thanks Swathi.. Thank you so much. Happy to know your palak paneer came out good. This is My favourite blog!! Thanks for the wonderful recipes that always turn out good. You are my saviour . 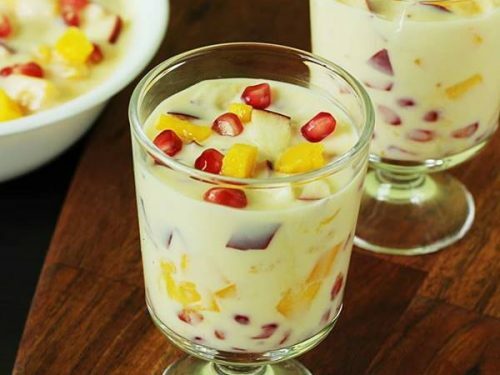 Keep helping us by sharing new recipes. You welcome. Very happy to know the recipes are helpful. Thank you very much. Yes sure will keep sharing. 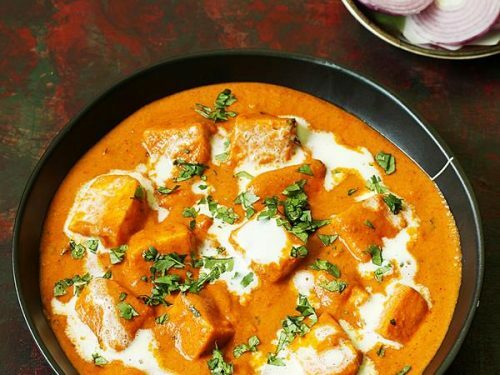 Love the way you inspire us in cooking awesome recipes. Thank you so much I have made coconut chutney many times. Thanks for trying the coconut chutney. I am glad. Erra pachadi dry coconut varana vachindi. Baaga raledu. SUGGESTIONS to improve. Did you use a large jar? Some blenders cannot blend red chilies to smooth texture. You can try soaking the chilies in water for 10 to 15 mins and then blend them along with coconut. Please use small chutney jar to make coconut chutney smooth. Most large jars don’t yield smooth coconut chutney as the quantity is less. Also add little more water if needed while blending. 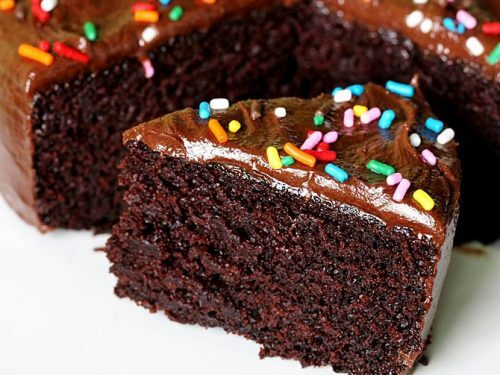 Amazing recipes You have. 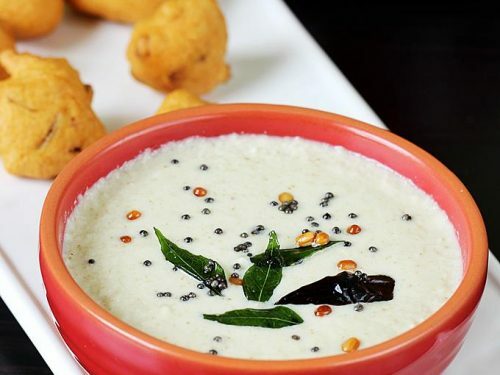 I am definitely going to try this coconut chutney with my rava uttapam. Thanks for the recipe! 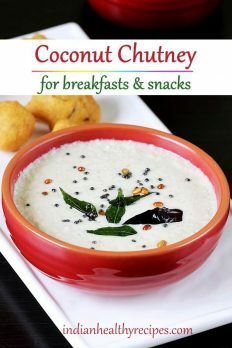 Can i use desiccated coconut instead of fresh for the “Basic simple coconut chutney for idli, dosa & other breakfasts”? Fresh coconut always tastes best for coconut chutney. You can try with desiccated coconut but the taste will not be that good. Instead you can try with dried coconut or copra. Desiccated coconut lacks the flavor and taste that is present in fresh coconut. All are very delicious chutneys..Why can’t I copy and paste that on word to save it for later ? and keep thanking you over & over wen I make them ? चटनी चटनी चटनी व्वाह ! Thank you for the compliments. Glad to know you liked it. Thanks for all the comments on the blog. To make coriander garlic chutney, i just replace ginger with garlic in the above recipe. Are you looking for something else? Looking for something else as in? Woo! Nice instructions for coconut chutney. I like to prepare this.